Finally a golf training aid that helps you with every part of your game-The EYE. Designed by Great Golf Products with the help of Golf Channel SwingFix’s Mike Fay, The Eye is truly one of a kind. Easily transported, you can take The Eye where ever you go to work on your game. With the ball centered under the ring of The Eye, the pointer helps show the golfer how to make a pendulum stroke back and thru the pointer line, squaring the putter face at impact. One critical part of good putting is to keep the eyes on the ball and the head still thru impact, and not lift the head until well after the ball is gone. Maintaining the head and eyes down and on the ball in the ring of The Eye and after the ball is gone teaches the golfer this skill. This practice works equally well at home on the carpet and into a putting cup. With a ball ready to chip, the goal is for the golfer to chip the ball on the fly to the provided felt disc target placed on the green. The Eye teaches the golfer the following: First, selecting a club that will land on the green for a truer bounce. Second, picking a spot to hit to that takes into account the break on the green and the roll to the cup. All the pros chip or pitch to a spot. This is the best way to get the ball close for the putt, but it requires practice. Using The Eye again helps the golfer take the club straight back and thru on the pointer line, and keep his head still and eyes on the ball. This technique works well for a chipping club such as a seven, eight or nine. It works equally well for pitching from further back for a sand wedge or pitching wedge. The Eye has several valuable benefits for the golfer hitting iron shots on the driving range. With the pointer aligned with the target flag, the golfer can practice aligning his shoulders and feet correctly towards the target. During the swing, it is important to keep the head back and eyes on the ball at impact. Focusing on the ball inside the ring and turning around the spine to stay centered in your swing produces crisp iron shots. Another important benefit is to check the divot after the shot to be sure the divot center is several inches towards the target, indicating the ball then turf contact that is essential. Just looking through the ring after the swing to see where the divot provides feedback to teach the golfer to do this. Another built-in benefit is the molded posts on either side of the base. After each swing, the golfer slides The Eye backwards from the target a few inches with his club head as shown in the photo. Since they are on the center of gravity, the pointer remains in-line with the target for a number of swings and divots. The Eye is compact and easily transported in the zipper bag, fitting into any of the side pockets of the golf bag to be instantly available on the driving range, and the putting and chipping practice green. It also can be used indoors for practicing putting on the carpet thru the long northern winters. It is constructed of tough nylon moldings for years of use. 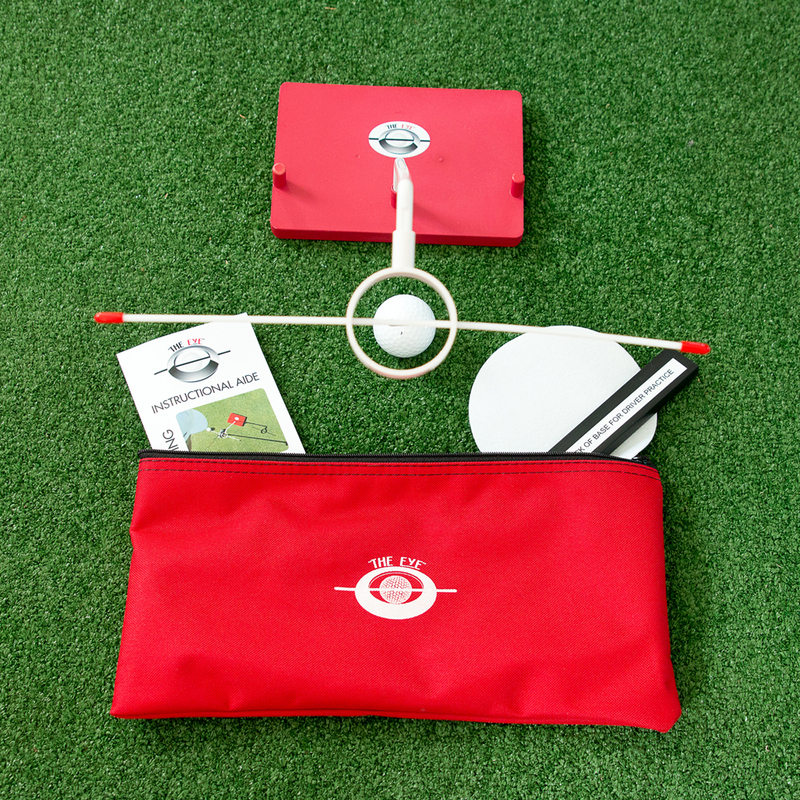 Price includes: The Eye golf training tool, zipper bag & driver clip.